Learn the best LinkedIn strategies and practices for improving your profile, searching, connecting and sharing your expertise and professional brand. Wayne Breitbarth was once an unwavering social media skeptic and is now a LinkedIn expert who will help you access the full power of LinkedIn. He is an experienced businessman, speaker, and author and an internationally recognized industry leader in LinkedIn training, marketing, and consulting. Wayne has taught tens of thousands of people how to effectively market themselves and their businesses with LinkedIn. Each attendee will receive a free copy of Wayne's critically acclaimed book. 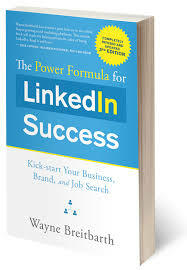 The Power Formula for LinkedIn Success now in its 3rd edition Sponsored by Waterstone Mortgage Corporation.